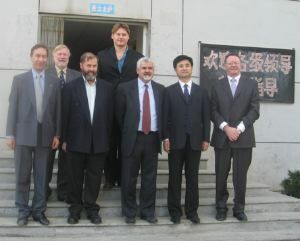 The Delegation visited the High School attached to Xianyang Normal University and participated in two English classes. 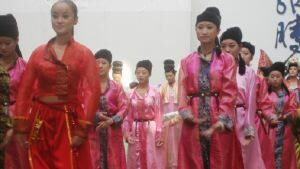 Robert Black asked students questions in an English class and responded to their answers. 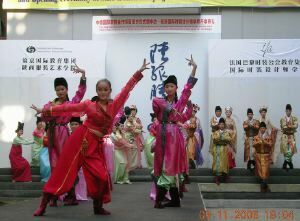 There were approximately 85 students in the class. 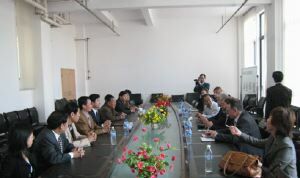 Robert interacting with students in an English class. 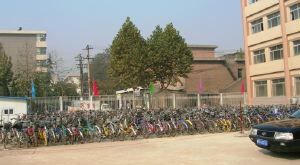 A bike park at the High School. It would seem the school has adopted Moreland Council's bike policy. 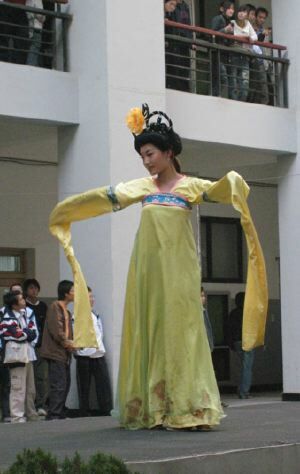 The Shaanxi Costume and Dress College offers education in the areas of fashion design and garment manufacture. 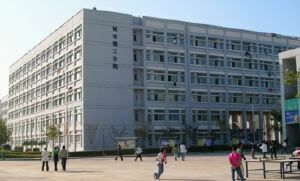 It caters for students in the area around Xianyang and Xi'an, but draws students from across North West China offering on-site accomodation. 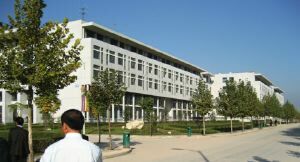 It has recently moved into its new modern campus. 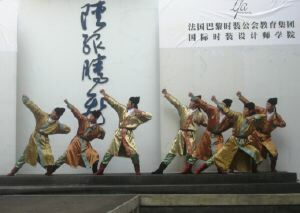 Fountain outside the new buildings of the Shaanxi Costume and Dress College. 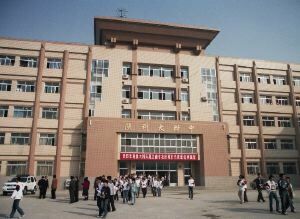 New buildings of the Shaanxi Costume and Dress College. 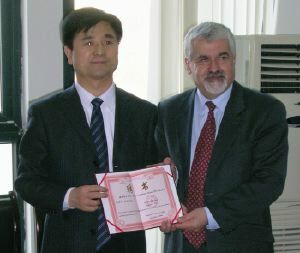 The Principle of the Shaanxi Costume and Dress College, Mr Lu Min with Anthony Helou. 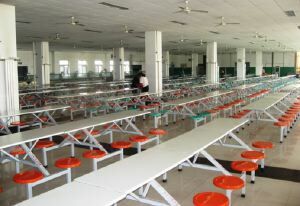 The Cafeteria of the Shaanxi Costume and Dress College. 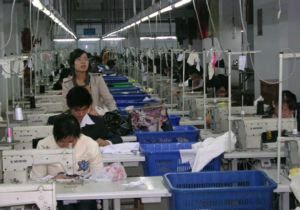 Shewing machine stations for students to produce their own designs. 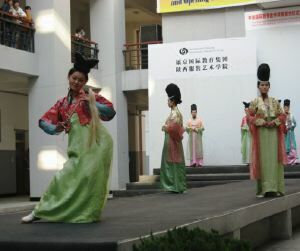 A performance was put on by students of the Shaanxi Costume and Dress College. 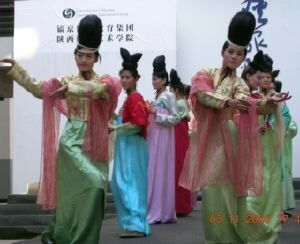 The venue is part of the campus of the Shaanxi Costume and Dress College. 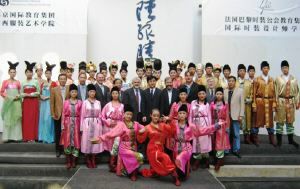 The performers posing with the College Principle and Moreland Delegation members after the performance. 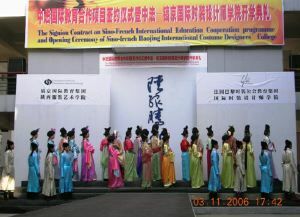 Acknowledgement: The photographs displayed on this web page were taken by members of the Delegation from Moreland, but it is difficult to attribute individual photographs.